"Reign of Doomsday": Part 5 - "No Fear"
At Titans Tower, Conner and Tim are having a heart to heart. Musing about family, loves and where they belong in the world. Now that Cassie has ended her time on the Titans and her relationship with Conner, he's evaluating his life and even his past as the 'Kid' in Hawaii. After a vent, Conner heads back to Smallville but lost in an inner monologue he is blind sided by the brute Doomsday! Over at Ivy University, Simon has gone to visit Ray Palmer, a.k.a The Atom. Ray is setting up a group called Advanced Meta-Science Studies and is gathering the smartest young minds to nurture them. After a recommendation from Conner and a viewing of Valentine's portfolio Ray is convinced Superboy's pal would be perfect for the program. Simon declines and admits, that though it's the best offer he's ever had, somehow he feels like something is leading his destiny to something much bigger. Ray appreciates Simon's muddled thoughts and offers to always be there should he need him. While the two chatter on about science they fail to notice Psionic Lad watching them from the shadows. 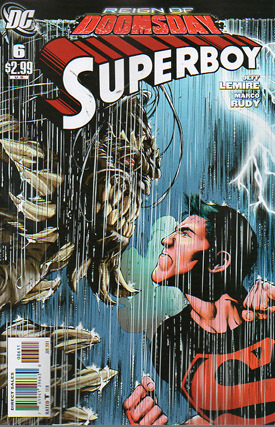 Superboy meanwhile is taking a heavy beating. Conscious of the civilians, Conner battles the monster while leading him away from the populace and where he can't get the leverage to get the upper hand. During the battle Conner is shocked to see that Doomsday is mimicking his abilities but to much higher levels. Conner holds out for as long as he can but eventually Doomsday is able to win and grabs the Teen of Steel's slumped body. Teleporting into space, Doomsday takes Conner to a large spaceship, which speeds away out of sight into deep space. Story - 5: I loved the Atom storyline that ran recently, also penned by Lemire. So to see Ray appear here and in the context of being a friend of Conner and an equal to Simon, was just expertly crafted. Action has never been at the forefront in Superboy so far, so to see it really pushed here and still working while welcoming in readers of only the 'Reign' storyline from across the titles, it's a comfort to see it working and continuing through. Art - 4: The change of pace to an all-out beat down really works while not detracting from the title's usual atmospheric art. Yes, I noticed the parallels with the Death of Superman and the panel with Conner in the exact pose Clark died in sent shivers down my spine! Cover Art - 4: The first 'Reign' cover that genuinely gives you the feeling (borrowed from Tiny Titans) "Aww Yeah!" The rain, the lightning, the menacing evil and the defiant hero, it's all there!